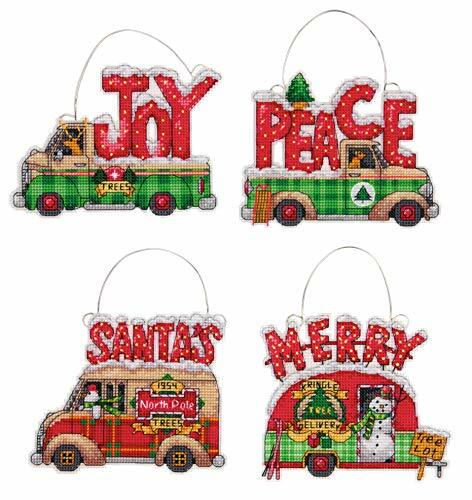 Get in the Christmas spirit with this Dimensions holiday truck Christmas ornaments Counted cross stitch kit. Featured are four, holiday ornament trucks, out to help Santa with deliveries to kids across the world. Use these ornaments on your tree or for package decorating. Holiday cross stitch kit includes 14 count plastic canvas, pre-sorted cotton floss, (1) needle, wire, chart and easy-to-follow instructions. Each tree ornament measures 5 inch W x 4 inch H when complete. 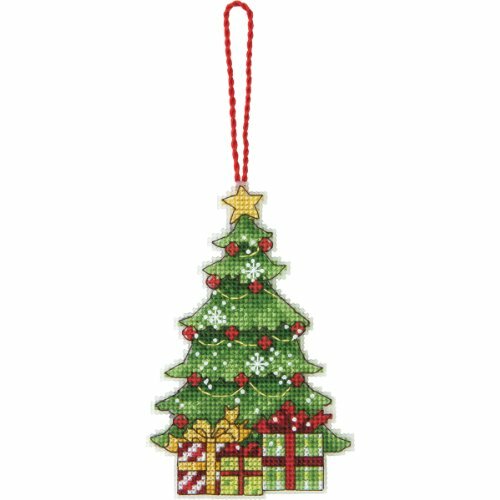 Decorate your Christmas tree with this fun and festive Dimensions Counted Cross Stitch Christmas Tree Ornament! This easy cross stitch kit contains everything you need to make a homemade Christmas tree ornament, featuring a perfectly decorated tree complete with presents! When you've finished stitching your Christmas craft, hang it on your tree or gift it to a friend! 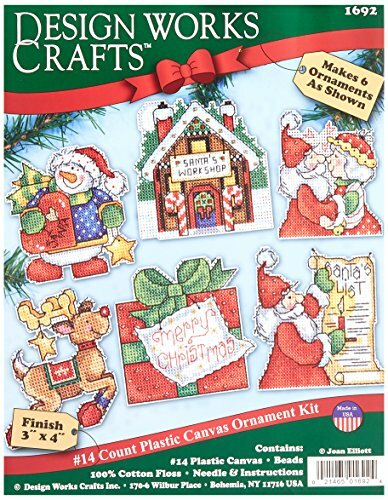 Cross stitch ornament kit includes presorted cotton cross stitch thread, 14 count plastic canvas, stitching needle, and easy to follow instructions. Completed Christmas tree ornament measures 3'' x 4.75''. TOBIN-Design Works: Plastic Canvas Kit: Ornaments. Create adorable ornaments that will be a great holiday decoration or to give out as gifts! This package contains 14 count plastic canvas; beads; cotton floss; needle and instructions. Design: Santa's Workshop. Finished size: six 3x4 inch ornaments. Made in USA. Counted cross stitch: tiny ornament stocking. 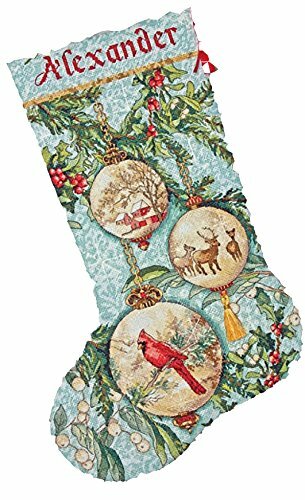 These 3-1/2-inch stockings are adorable. 30 beautiful holiday designs are in this complete kit. Kit includes: 14 count white aida; cotton floss; floss separator; needle; felt backing; and tri-lingual instructions and charts. Made in USA. 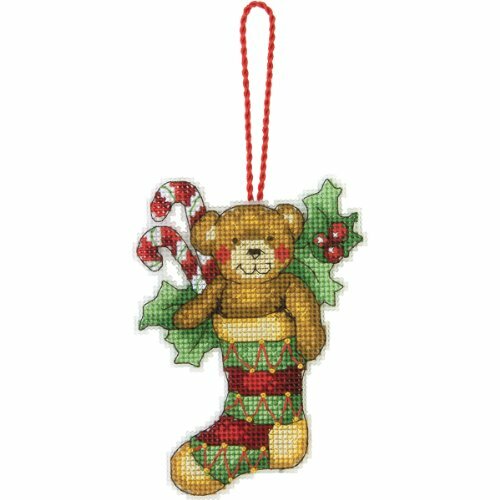 Decorate your Christmas tree with this fun and festive Dimensions Counted Cross Stitch Teddy Bear Christmas Ornament Kit! This cross stitch kit contains everything you need to make a homemade Christmas tree ornament, featuring a cuddly teddy bear peaking out of a Christmas stocking! Includes presorted cotton cross stitch thread, 14 count plastic canvas, stitching needle, and easy to follow instructions. Completed teddy bear ornament measures 2.5'' x 4.5''. The Gold Collection: Counted Cross Stitch. The Gold Collection Kits are wonderfully detailed with full and half cross stitches. Kit includes: 18-count ivory Aida, cotton and metallic thread, felt (for backing), needle, and easy-to-follow instructions. Also need but not included: glue and batting. Finished size: approximately 5x3-1/2" each of six. 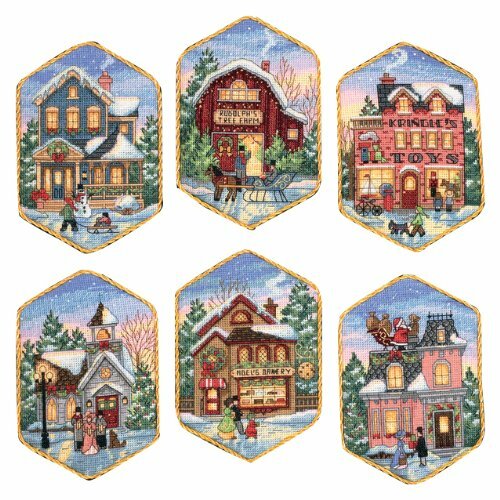 Design: Christmas Village Ornaments. Designer: Brian Jackins. Made in USA. 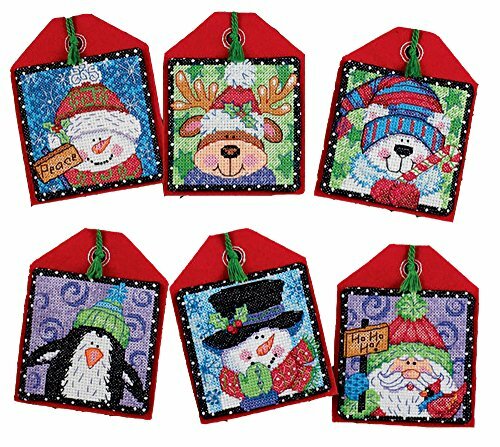 Dimensions Counted Cross Stitch 'Enchanting Ornaments' Personalized Christmas Stocking Kit, 16"
This year, hang a homemade Christmas stocking above the fireplace! 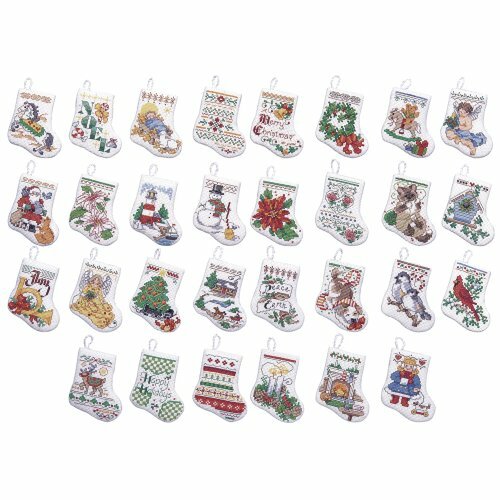 The Dimensions Counted Cross Stitch Personalized Christmas Stocking Kit features three elegant Christmas ornaments hanging delicately on a branch. Personalize this Christmas craft by stitching the name of a child, friend, or loved one above the elegant Christmas scene! Includes presorted cotton thread, metallic thread, wool yarn, 16 count light blue Aida, polyester felt, needle, and easy to follow instructions with alphabet. Completed stocking measures 16'' long. 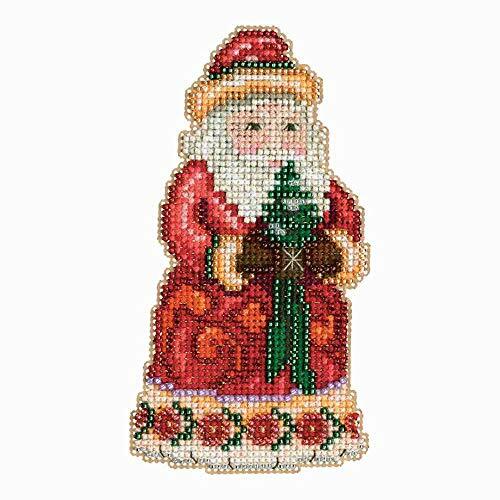 Decorate your Christmas tree with this whimsical Dimensions Counted Cross Stitch Santa's Sleigh Christmas Tree Ornament Kit! 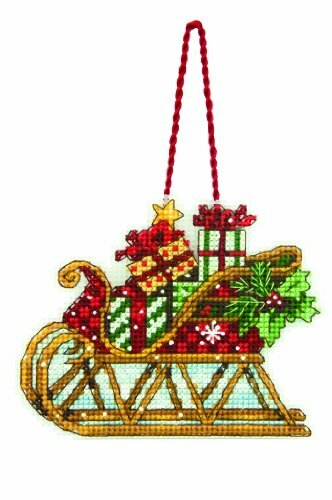 This festive cross stitch ornament makes a great gift tag or window decoration, and features a colorful sleigh full of presents from Santa! When you've finished stitching your Christmas craft, hang it on your tree or gift it to a friend! Cross stitch ornament kit includes presorted cotton thread, 14 count plastic canvas, stitching needle, and easy to follow instructions. Completed Christmas tree ornament measures 3.25'' x 4.25''. Size: 2-1/2"X3" 14 Count Set Of 302\" x 3\"